Adaptability and flexibility, preparation and communication, stress management and staying in the moment. A group of students from the School of Urban and Regional Planning who recently took part in the International Planning Project course (SURP 827) gained a world of experience and learned valuable lessons as they traveled to India for two weeks to create a project report of professional quality for the community of Auroville. The course is a collaborative challenge that tests the students’ resilience and abilities, but, at the same time, provides an opportunity to develop new skills and knowledge as they look to their future careers as planners. Preparations are key for the planning course. Starting in September, the student team, which this year happened to be entirely female, had 12 weeks to conduct advance research, collect information, and make initial contacts before heading to India in early December. 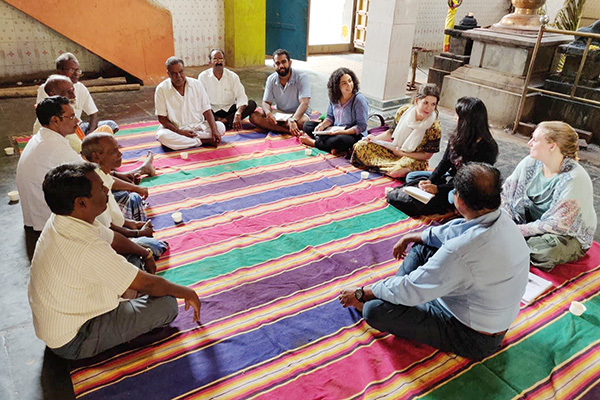 The team then had two weeks to gather information and develop a tourism management plan to be presented both in Auroville and back at Queen’s. Arriving after a 30-hour flight and a three-hour drive, the team quickly got to work on the first day. The first week is primarily filled with gathering information on the ground, analyzing, and making adjustments before preparing the report and making the final presentation. It’s a whirlwind of activity and no one can do it alone. Some of the major tools that come out of the experience, says project manager Natalie Armstrong, are teamwork, adaptability, and communication skills. With a tight deadline, time management is crucial. Despite the pressure, the team set schedules, learned to alter course when needed, and came through with a final product on time that was well received. Now in its seventh year, the International Planning Project course, led by SURP Professor Ajay Agarwal, provides a real-world and international experience. This opportunity to step outside of North America is a key element for the school and continues to attract students to Queen’s. For more information about the course or to obtain a copy of the full project report, contact Dr. Agarwal.